Google has made major improvements to its Chrome web browser that would once again make it one of the least memory eater browsers in the market. Although Chrome is used by hundreds of millions of people worldwide due to its simplicity and power, most people aren't happy with it because it uses too much memory and power. Google has now solved these problems. The most recent release of Chrome (Chrome 45) is intended to make your browsing experience faster and more efficient. Google launched Chrome 45 for Windows, Mac, Linux, and Android two days ago, but the company announced in an official blog post Friday that the new version includes several new updates that focus on making the browser load faster and use less memory. A major issue reported by Chrome users was the browser's consumption of PC memory. This problem has now been fixed in Chrome 45 by replacing an older feature with a new one, according to the Chrome team. Chrome provides you an option to "continue where you left off" so that you can restore tabs whenever you relaunch your browser. But this time, instead of loading all the previous tabs, Chrome now loads them in a more efficient manner. First, Chrome loads your most recently used tab, then the tab viewed before that, and so on, restoring the tabs from most to least recently viewed, so that you can check out the more important tabs in a moment. Chrome now recognizes when your computer is running low on resources while restoring tabs. So, to save memory, the browser then stops restoring tabs until you click to restore them yourself. This feature will help those who regularly have a few dozen tabs open at a time. Even if memory usage is a big issue for you, you can refer my article, "I keep 200+ Browser Tabs Open, and My Computer Runs Absolutely Fine. Heres My Secret." 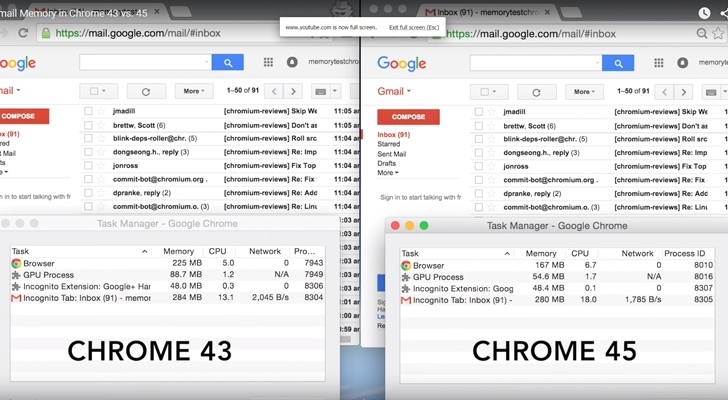 This would save 10 percent of RAM on average, claims the Chrome team. Another big issue with the browser is its consumption of the battery. The company solves this problem as well with the release of its Chrome 45. Google added a new feature to Chrome 45 that automatically pauses non-essential Flash contents, like advertisements displayed on the sides of your page, so that your battery lasts longer. So with Chrome 45, opening a new tab will not knock down your battery by auto-playing videos and Flash contents. Google's tests have shown that this feature alone resulted in 15 percent more battery life on tested devices. This means you can now enjoy your laptop for longer periods of time without dragging your "lappy" charger with you everywhere. You can update to the latest version of Chrome (Chrome 45) now by using the Chrome's built-in silent updater or downloading it directly from google.com/chrome.